The GreenChill Partnership is an EPA partnership with food retailers to reduce refrigerant emissions and decrease their impact on the ozone layer and climate change. In its publication http://www.epa.gov/greenchill/downloads/RealZeroGuidetoGoodLeakTesting.pdf it lays out best practice for leak testing and service work with the aim of reducing the escape of F-Gas and refrigerants. 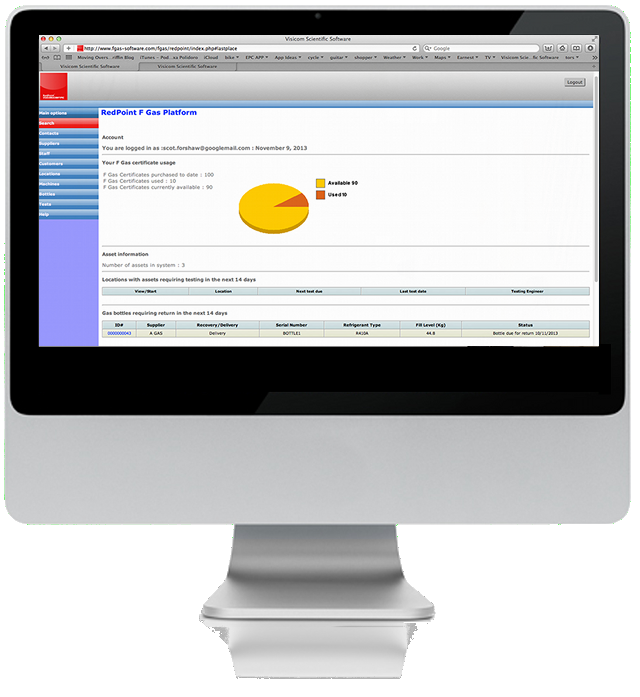 RedPoint F-Gas is a complete mobile and desktop software solution to assist you to meet or exceed these requirements. Capable of tracking every single ounce of gas recovered/lost or decanted during HVAC servicing, along with dozens of cost saving field service features designed from the beginning to help the HVAC industry reduce gas emissions, meet targets and save money. Compatible with both USA and EU F-Gas / EPA requirements RedPoint F-Gas is the suitable for any company size from 1-1000 engineers and for large HVAC users such as supermarkets, malls, hospitals and government buildings. Protect the environment, satisfy your clients and manage your HVAC business with one integrated and scaleable software product. 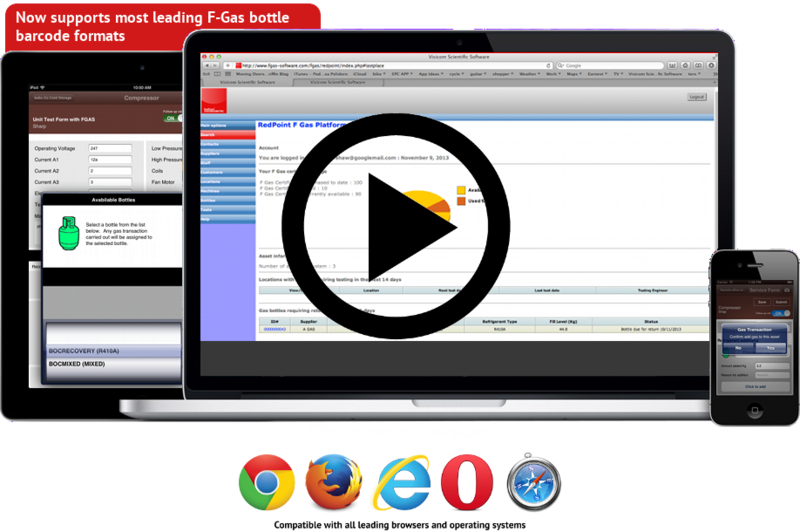 Would you like to give your HVAC customers their own website login to access their F-Gas, Service and Asset information? We are excited to announce that all RedPoint users can easily issue logins to their customers so that they can download, print, search and export their F-Gas certificates, latest service visit information and asset lists from their PC , iPhone or tablet! Check out the new features under your customer management tab. RedPoint F-Gas is already one of the most respected and flexible F-Gas compliance and field service solutions for the HVAC and ACR industry, so the news that the imminent V1.0.4 of the app will bring even more exciting features may not take you by surprise. Building on its already beautiful iOS 7 design, the designers have paid serious attention to user feedback to take ergonomics and usability to new levels. 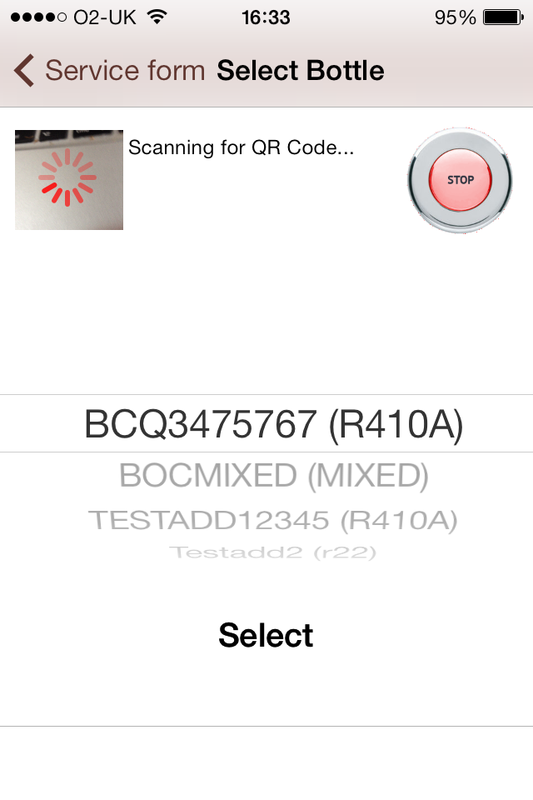 Building on RedPoints intrinsic use of QR barcodes the new ability to instantly scan from asset to job sheet with only 1 click will save lone engineers even more time on site and reduce operations required to begin on demand maintenance call outs. Engineer autonomy has been a subject for debate with many customers asking for greater functionality and this has been addressed to allow single engineer permissions to be set allowing almost any task to be completed from the app without having to access the back office! V1.0.4 is due to hit the app store imminently so be sure to update as soon as you get the option. Until recently RedPoint F-Gas has been targeted at solely at European ACR and HVAC users. However as the several states in the USA are adopting EU style F-Gas compliance regulations, we have been quid to respond to this need. A regionalised back office system has been employed to allow US users to adopt RedPoint F-Gas as their first choice F-Gas compliance and tracking solution. The changes are active now and facilitate the use of US Imperial units and US date formats. We have extended our registration system to support US users. Update 1.04 of the app which is due on iOS imminently will fully support US regionalisation as well as supporting all the usual great features you have come to expect front he RedPoint F-Gas product range. 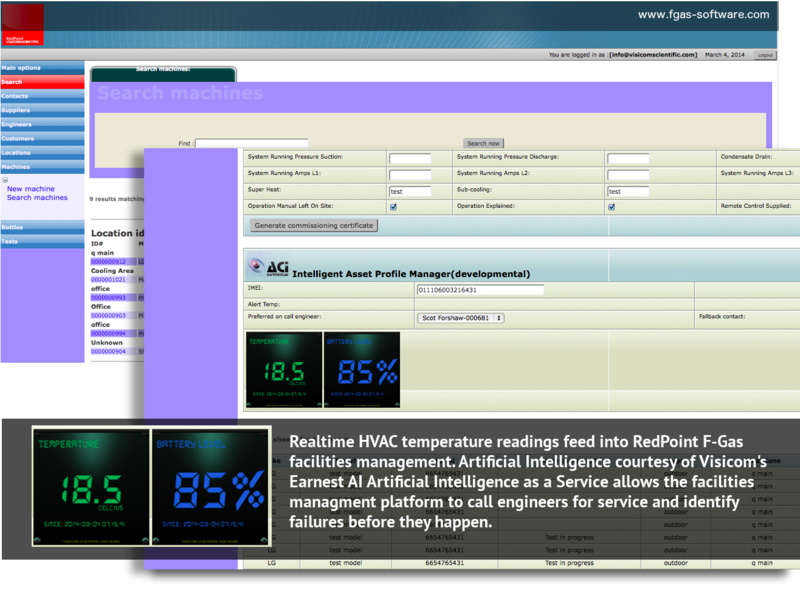 With RedPoint ACI Intelligent Asset Profiles you can offer customers with strict temperature requirements the most responsive service imaginable. By connecting remote temperature sensors (existing or newly installed) to Visicom’s RedPoint HVAC monitoring platform, RedPoint F-Gas can pull down realtime temperature statistics directly into the asset management and service profiles for the ultimate in critical temperature monitoring. 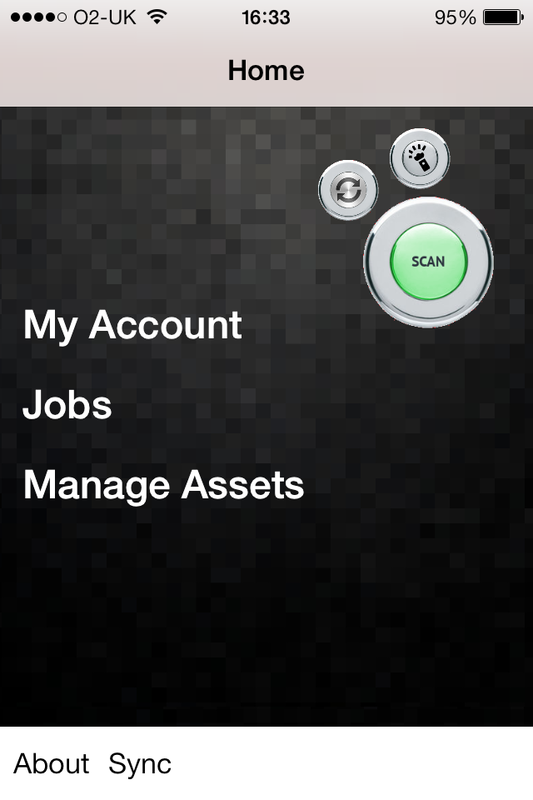 Each asset can have its own priority service personality “An Intelligent Asset Profile or IAP”. RedPoint F-Gas uses Artificial Intelligence to monitor the asset and make decisions when to alert key personnel to problems. The IAP attempts to detect if temperature variations are due to failure or regular patterns. Rises or falls that are out of character will first alert engineers by email or SMS. The recipient can pull up the temperature on their RedPoint F-Gas mobile service app and decide if a call out is required. If certain parameters are met, RedPoint’s IAP manager system will automatically raise a job, send it to the on call engineer and send them an email to alert them. RedPoint Monitor is capable of taking data from many off the shelf temperature sensors, GSM sensors and a multitude of other digital and analogue sensors and we can work with clients to develop more advanced systems to pull in pressure, current and fallout relays. 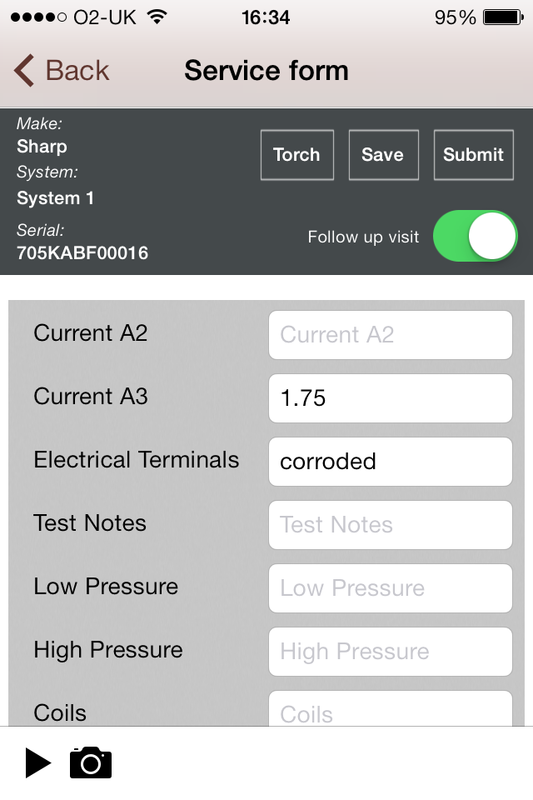 IAP is currently in beta stage and of course requires the installation of temperature sensors on the asset or even the room the asset serves. Some features may be subject to change whilst beta testing is completed. You’ve used it for years, its reliable, I have a print out in my hand, but in the end its going to cost you big time. The story is the same only the names have changed. The reality is that many asset managers still hold onto XL spreadsheet based systems for fear of change not due to the absence of viable, cost effective and simply better alternatives. The fear is driven by many factors, all of which are generally unfounded or worse, supported by company polices that are no longer fit for a cloud enabled world. Data security tops the list of concerns. The idea that cloud is somehow insecure or at least less secure than keeping XL files on your company network or worse a personal desktop computer. This barrier is compounded because most fm managers will ask themselves “If I go this way and there is a data leak, it’s my head on the block“. The reality is that cloud or even better “private cloud (a cloud in your own private system)” will invariably offer far greater security provision than can be affordable upheld by the average company. There are a huge number of options to increase security of data for cloud systems and with a little understanding the potential for data breaches are very low. So what’s the future for your XL based fm or asset management system? It hasn’t got one is the simple answer. Why? because sooner or later contractors and fm service providers are likely to adopt their own electronic database driven solutions and having to hand ball 500 asset and service forms into your spreadsheet so you can sleep at night is going to start to eat into their bottom line. That can only mean one thing, increase cost of service to you. If you stick to your XL guns the argument becomes more hypocritical as those who provide the service will still want to put your assets onto their field service management system in order to be able to carry out the work and so your dream of a “secure system” starts to look a little infantile. Its like asking the post office not to store your address but instead find you by asking people on street corners how to find your house! Yes the post office can’t leak your data but everyone the postman asks along the way now knows you are getting a parcel…. OK, so you still like something to hold in your hand, thats understandable, but any Air Conditioning service software worth its salt will provide the facility to bring down your asset lists to other systems including XL. But remember when its weekend and your XL sheet is tucked away on your desktop pc in the office and you need to get an engineer out to site to repair that freezer which is defrosting 5K or stock, you may just think “I wish I had….”. Adopting a capable and well designed AC service platform will bring cost saving by making it easier to manage scheduled and on demand service work as well as compliance with F-Gas legislation. Holding onto the past is a natural reaction, but don’t hold on to long or you will get left behind. 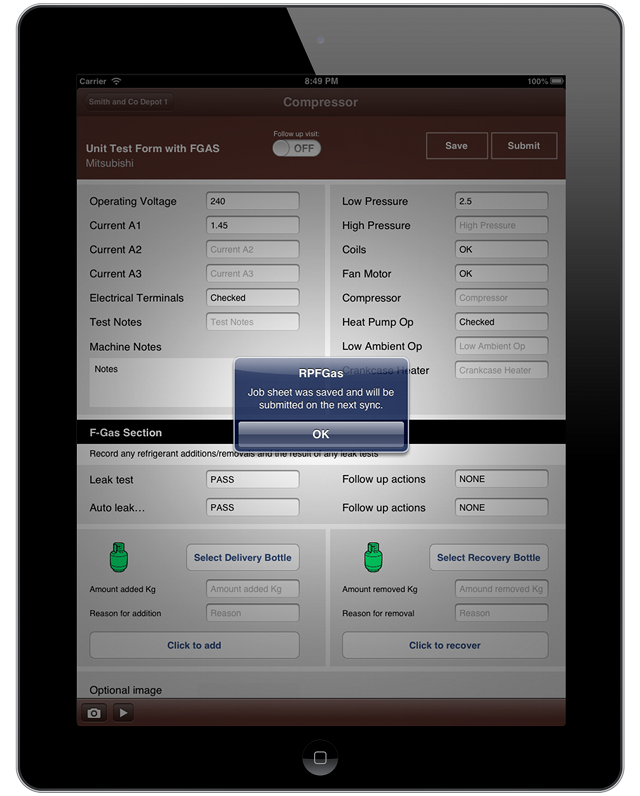 The RedPoint F-Gas Platform is a powerful but simple and cost-effective tool that helps you manage all your customers’ Air Conditioning and Refrigeration servicing needs using your iPhone® or iPad®. It produces Air Conditioning routine service, commissioning and F-Gas certificates that can be stored, searched, E-mailed or printed. It records all F-Gas usage on a per asset basis and manages your F-Gas bottle to keep you and customers fully compliant with F-Gas regulations. Our unique and flexible pricing options means that you only pay for what you use and the more you use, the cheaper it gets. 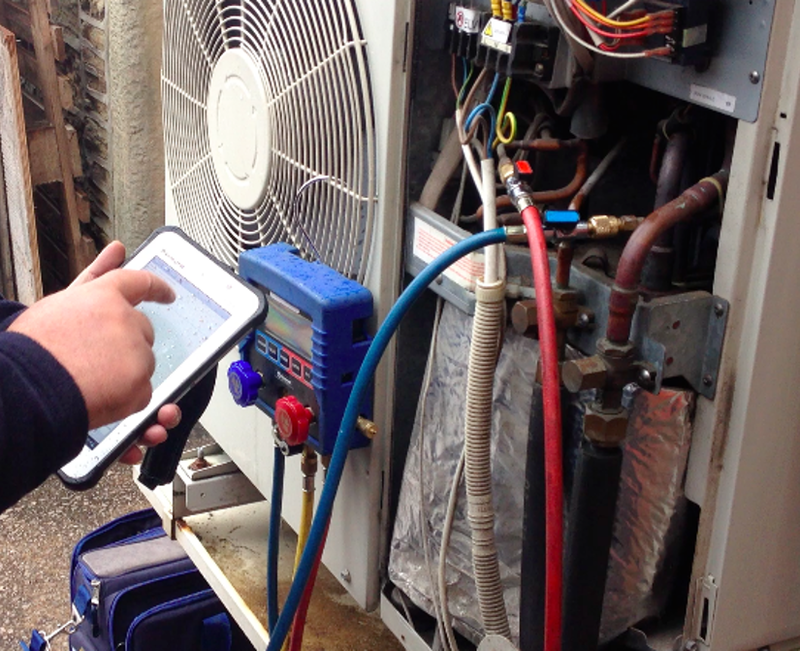 Today every HVAC engineer will have considered moving from paper based AC service records to a software based solution. After all every engineer most likely carries some form of mobile device with them, so why not put it to better use? 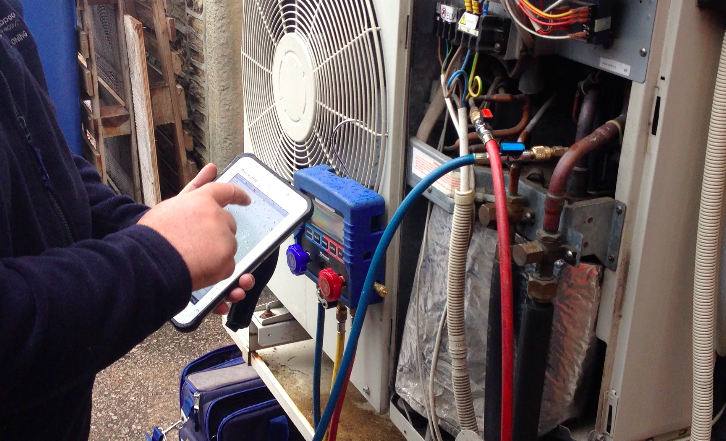 Done correctly moving to mobile is one of the single things any AC or Refrigeration company can do to improve their efficiency and used correctly it can bring huge rewards over and above making your day to day life easier. This article considers the Pros and Cons of adopting mobile and software based service solutions. On first impressions the Pros outweigh the Cons but by far and away the biggest barrier is populating a new software system with information. Without it it isn’t much use. So is there a way to dip your toe that is easy, carries little risk and won’t take all month? If you are just starting to consider mobile job management then you probably have work coming out of your ears and the last thing you want is to have to spend days or weeks putting information into a potential candidate system only to find out its not for you. Of course there is always going to be something to do, software isn’t magic after all but thankfully there is a way to test, evaluate and migrate on a sliding scale that won’t consume your working day. Using our software you can start with 1 engineer. Get the app and register for a free single engineer account. The process takes about 15 minutes to complete and by that time they will be ready to go. Run paper against mobile for a few weeks to see how it works. You engineer can report back to you on his progress and issues. Why not take RedPoint F-Gas for a test-drive today? Download the app and register for your free single engineer account. If you like it which we are sure you will upgrade to multi engineer at any time. Since the introduction of F Gas regulations there has been a lot of confusion surrounding the compliance aspect of keeping solid F Gas records. That’s not to say the service sector didn’t care, but flaky rules, changing dates and obligations have made it difficult for many caring service companies to communicate the impact of the regulation to their clients. One need only look at the R22 changes for 2014 and the total blank face that was received by many service providers when trying to talk to customers about it. Maybe we are seeing a change… and fast! The recent solidification of the near future F Gas policies has led to a resurgence of interest in the subject, this time on behalf of the owner operators. At last the service sector asks, they are getting the message? The answer is yes they are but it may leave many service companies with a new problem. Traditionally F Gas has been at best a ad-hoc affair for most owners and service providers. Paper records, spreadsheets and maybe the odd database. Because many owners didn’t see the worry and service companies had a hard sell to warrant the passing on of costs to develop robust software solutions, the situation is that most but the largest FM providers are ill equipped to handle the day to day responsibilities involved with maintaining modern and secure F Gas records. A new problem now arises as we are seeing a greater demand from large asset owners who are suddenly asking for electronic solutions to mange their bulging asset lists and to police the service contractors to ensure compliance. This should be a nice problem to have, as for once AC operators are understanding there is a cost involved and a benefit to be had. The problem is that unless the service providers involve themselves in the process early on they face the probability that they will have to engage with many different systems which will eat into time and money. It records all F Gas usage on a per asset basis and manages your F Gas bottle to keep you and customers fully compliant with F Gas regulations. Sounds familiar? That’s what one customer told us this week after adopting RedPoint F Gas to manage their F Gas bottles and update their field service engineers with RP F Gas app. RedPoint F Gas which is frequently one of the top selling Uk business apps is a complete Air Conditioning and Refrigeration field service system that simplifies your business and offers a wealth of powerful features.